Tender yellow cake layers with fresh blueberries, streusel filling and blueberry buttercream make up my new Blueberry Streusel Muffin Cake. Ryan’s dad makes a homemade blueberry muffin that tastes like it’s straight from a bakery. 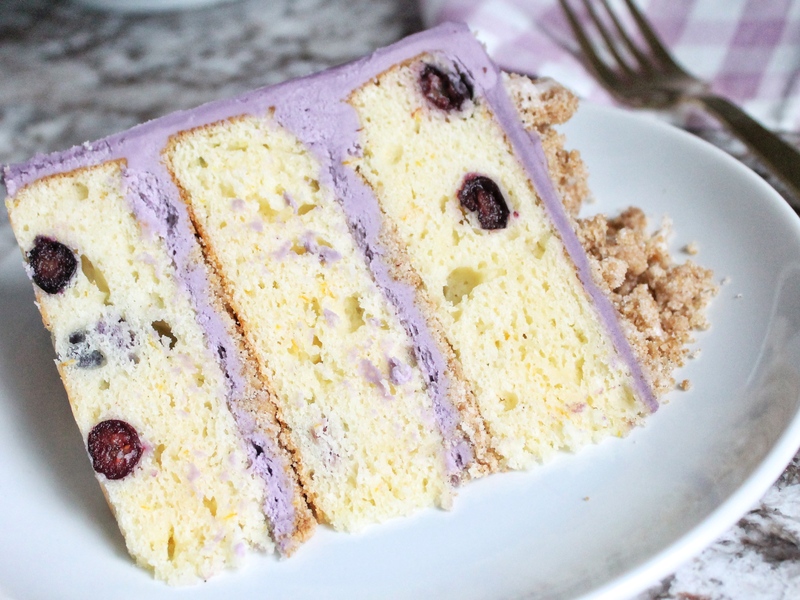 It’s light and fluffy, with fresh blueberries and a subtle buttery flavor that reminds me of a boxed yellow cake. Everyone goes nuts for them when we’re in town visiting grandma and grandpa. The muffins came to mind the other day when I was thinking of ways to try out the LorAnn Oils Blueberry Emulsion. I picked up the emulsion a few weeks ago and have been dying to try it ever since. I’ve loved the flavor of some of the other LorAnn emulsions (like coconut, raspberry, and strawberry, to name a few). They’ve added great flavor to my frostings and cakes, and often come in flavors I can’t typically find in extracts. But before I go on. Let’s talk about emulsions and extracts. A lot of you have asked what the difference is between the two, since I use both in my recipes. The easiest way to explain it is that the extract is the real thing. The flavor has been extracted from the item the flavor name describes and set in alcohol. An emulsion, on the other hand, may use some particles of the real thing or it could be a mixture of artificial flavors. Emulsions are either oil based or water based. Emulsions and extracts can be used in place of each other, with a 1:1 ratio. I don’t think you’ll really notice a difference between the two, but you may find that it’s easier to find certain flavors in one version than the other. 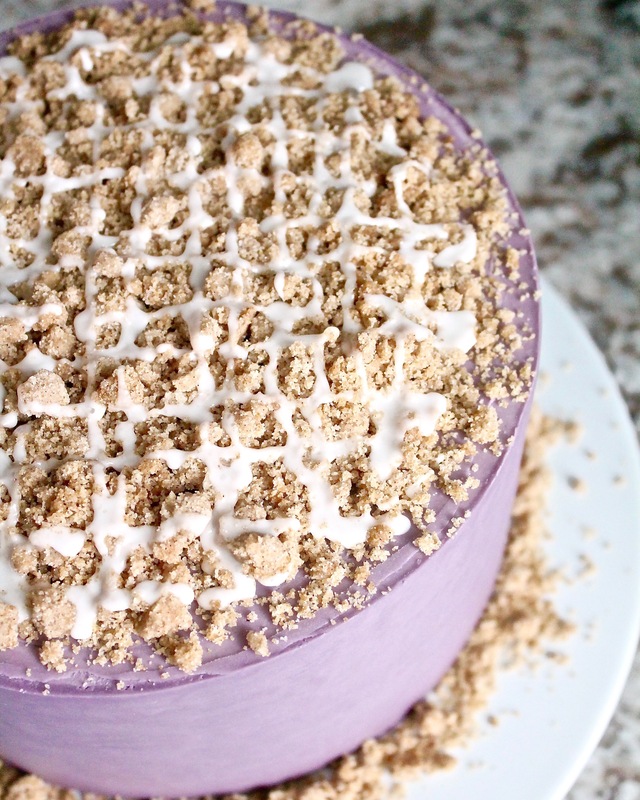 I used my Classic Yellow Cake as a base for this cake, added fresh blueberries, blueberry buttercream and then whipped up a cinnamon crumble to add between layers and on top of the cake. You know me! I love a little texture in my cake. I was so excited when Ryan took a bite of this cake and immediately compared it to his dad’s muffins without me saying a word about the muffins being my inspiration! Definitely a breakfast worth cake! 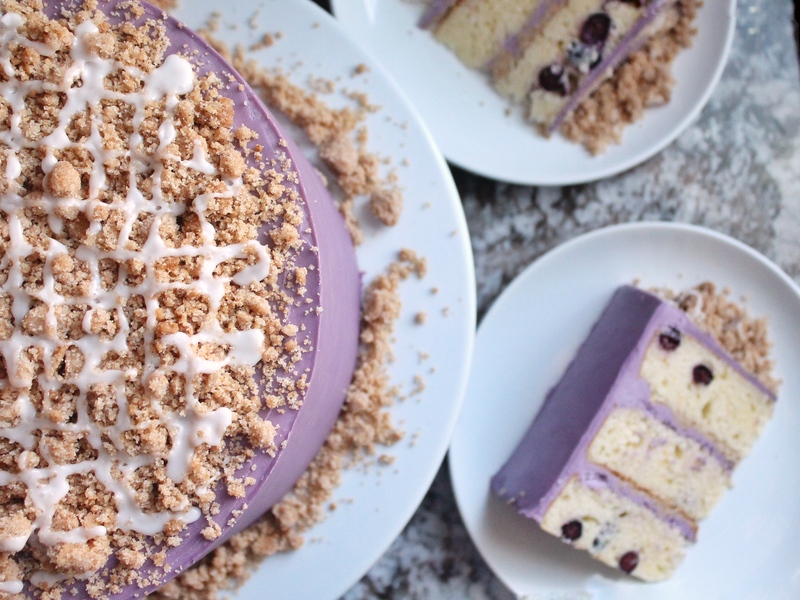 Tender yellow cake layers with fresh blueberries, streusel filling and blueberry buttercream. Preheat your heat the oven to 300°f. Combine the sugars, flour, baking powder, cinnamon and salt in the bowl of a stand mixer fitted with the paddle attachment and mix on low speed until well combined. Add the oil and vanilla and paddle again to distribute. The wet ingredients will act as glue to help the dry ingredients form small clusters. Continue to mixing until that happens. Bake for 15 to 20 minutes at 300°f. Let the crumbs cool completely before using in a recipe. Store in an airtight container, the crumbs will keep fresh for 1 week at room temperature or 1 month in the fridge or freezer. Preheat the oven to 350 degrees F. Prepare three 8" round cake pans with butter or non-stick spray, parchment and another coat of spray. Set aside. Add orange zest, followed by the eggs and egg yolks, one at a time. Beat on medium until well incorporated. Turn the mixer on low and add 1/3 of the flour mixture to the butter mixture and mix until fully incorporated. Then add half of the sour cream and blend well, followed by another 1/3 of the flour mixture, the second half of the sour cream and lastly, add the remaining flour mixture and mix until incorporated. Add the clear vanilla extract and butter extract and beat on low until incorporated. Scrape down the sides of the bowl and mix on low for another 30 seconds. Dust the blueberries in a little flour and then add to the batter. Carefully fold in the blueberries. Evenly distribute the cake batter among the three pans and bake for 25-30 minutes or until a toothpick inserted into the middle of the cakes comes out clean or with just a few crumbs. Make sure not to over bake. Remove cakes from the oven and let cool in pans for 10 minutes before inverting onto cooling racks. Once completely cooled, wrap in plastic wrap and place in the freezer or refrigerator to chill before frosting. Add the blueberry emulsion, salt and heavy cream (one tablespoon at a time). Once the cream is incorporated, increase the speed to medium-high and beat the frosting for five minutes. It should get lighter in texture and color. Use a spoon to mix the frosting by hand, which will push out the air pockets created by the electric mixer. Place the first cake layer, top side up (crumb side up), on a cake board or cake plate. Using an offset icing spatula, evenly spread about one cup of frosting over the cake. Sprinkle about 1/3 of the crumble on the frosting. Gently place the second cake layer on top of the frosting and crumble and repeat steps 1 and 2. Place the final cake layer top side down on the second layer of frosting and crumble. 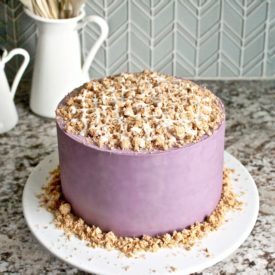 Apply a thin layer of frosting around the entire cake and then freeze the cake for another 10 minutes to set the crumb coat. I am baking this cake right now and it smells so good! I don’t see the icing on top of the cake in the recipe? Anyone know how to make that?